Alongside a good portion of the eating public, I've recently developed an infatuation with ramen. It's not very original - everyone is obsessed with it right now - but it's something I'm taking seriously. Maybe it's because High Five Ramen (arguably the city's bet) opened up just blocks from my house. Maybe because on my last trip to NYC I discovered the glory that is Totto Ramen, a tiny basement restaurant with 12 seats that Sarah and I waited an hour and a half - in the rain, sans umbrellas - to get in to. Or Maybe it's because the wisdom of Japan rings true … That ramen, with it's warm, silken broth and curly noodles is the ultimate comfort food. Whatever the reason, with the onset of Fall, it's become our go-to Sunday wind down treat and this week I decided to make my own. If you read last week's post, you'll remember that I was in the throws of panic anticipating the end of grilling season and frantically smoking everything in sight. Well, lucky for the ramen broth, the panic continued into this week and I smoked two juicy beef necks and because this is tonkotsu (translation: pork), some already smoked ham hocks (that's right - double the smoke!). I did this in 45 degree weather and a light but persistent drizzle. I'll probably get a miserable cold but I'll have some serious smokey ramen broth to nurse myself back to health. Of course no broth is complete without a vegetable base. It need not be complicated, just some onions, garlic, carrots and herbs and - because this is ramen broth - a nice assortment of pungent dried mushrooms. When it comes to dried mushrooms, Porcinis are the best. They're slightly pricier but they pack an umami punch that is superior to most other mushrooms. If you can't find Porcinis on their own, most decent dried mushroom blends will include them in the mixture. Rehydrate them in hot water before you roast the vegetables and save the water - your ramen broth will thank you when you add it in later! 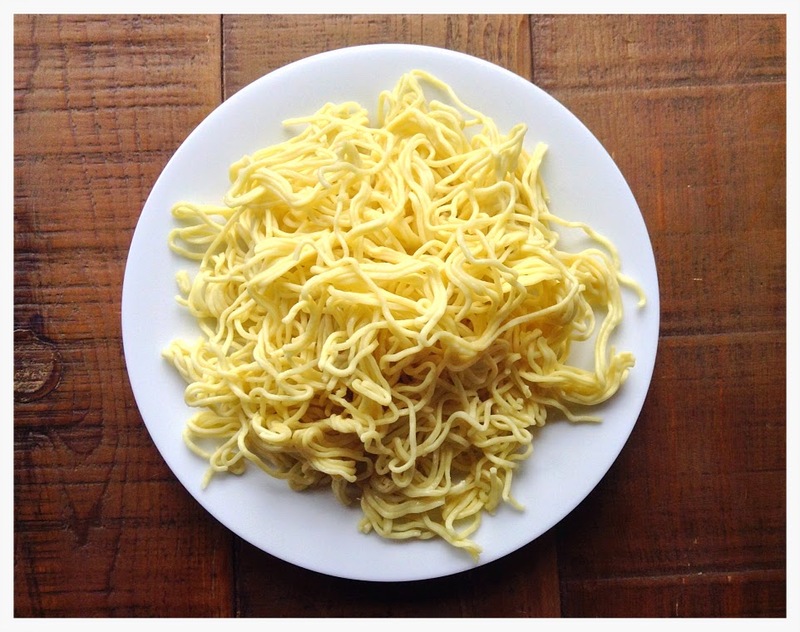 When it comes to selecting a ramen noodle, there's a lot to choose from. I'm not kidding, the varietals are probably in the hundreds. Serious ramen chefs are pretty passionate about their noodles as well as the etiquette that dictates how they're eaten. It's said that a perfect ramen noodle is only supposed to last five minutes beyond the moment the hot broth is added before it becomes mushy. This may be where the practice of hurriedly slurping one's ramen originated, madly eating it before the noodles fall. I like a fresh, thin noodle with just a little wave to it. The thinness of the noodle causes them to wrap together a bit, increasing the odds that they'll catch more of the porky broth with each bite. The curl also helps to harness the broth as well as the little bits of miso floating about. As you might imagine, the addition of the egg yolk ramps up an already rich broth considerably. Yes, ramen is soup but make no mistake, it's hearty and unctuous and welcomes the company of a good beer. I chose Arctic Pranzer Wolf from Three Floyds Brewery. I wanted a beer that had the potential to stand up to the intensity of all that smoke and fat and the strength if this IPA did so beautifully. As 3 Floyds declares, this is indeed a "massive" IPA but it's also slightly fruity and there is a buoyancy to the mouthfeel that keeps it refreshing. Even after large bowls of ramen Sarah and I polished off two bombers and despite the nasty cold I feel creeping on, slept like babies. 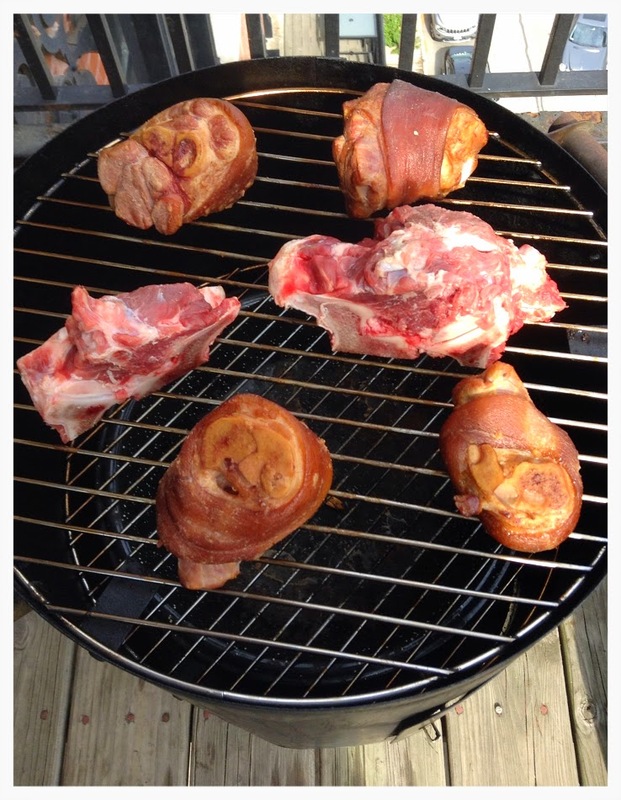 Smoke the ham hocks and beef neck bones for 3 hrs, maintaining a 200 degrees temperature or until they are bright red in color and the meat pulls from the bone easily. While the bones are smoking pre heat the oven to 375 degrees. Place the dried mushrooms in a medium sized bowl and fill with very hot water. Cover and let sit for 20-25 minutes. Drain and reserve the liquid. Chop the carrots and onion into medium-large pieces and break up the garlic. Mix the vegetables in a large bowl with the dehydrated mushrooms, thyme, peppercorns and olive oil and lay on a baking tray. Roast for 45 minutes, stirring them up every 15 minutes. 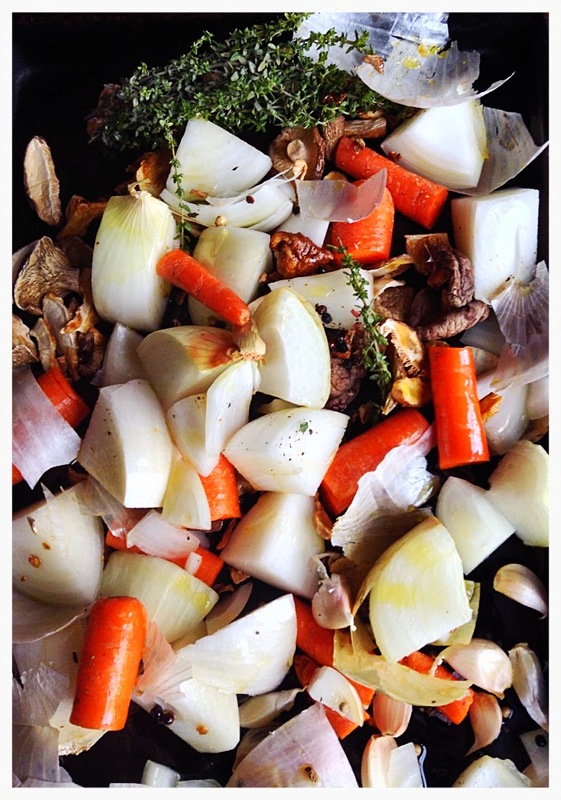 Place the roasted vegetable mixture and the smoked meat in a large pot and cover with water. Bring to a boil and turn down to a medium, boil for 6 hours. Strain and refrigerate overnight. Combine all ingredients in a sauce pan and simmer until dissolved. Chill the liquid in refrigerator. Pour over pork belly in a sealable container and refrigerate for at least 12 hours. Sear all sides in a hot sauté pan. 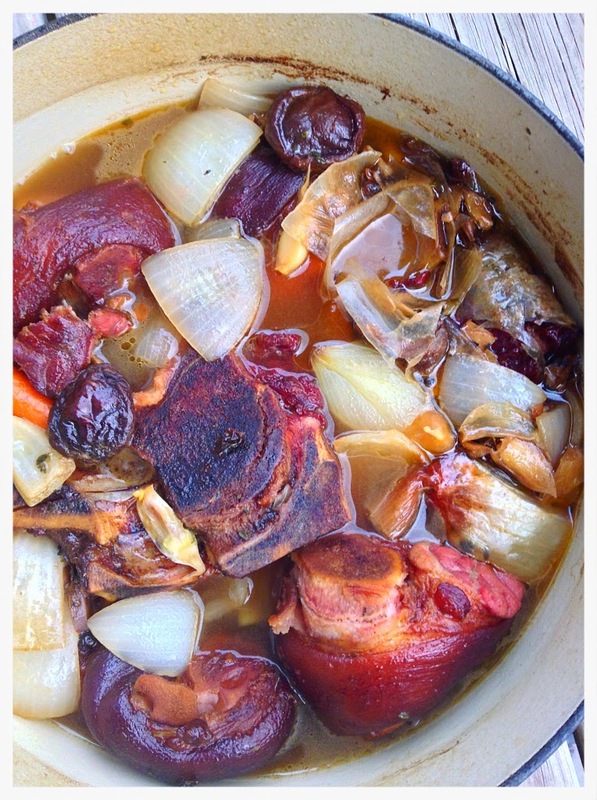 Place in a large dutch oven and cover with chicken stock, braising for 2.5 hours in 350 degree oven. Place eggs in a sauce pan and cover completely with water. Bring to a boil over high heat. Once the water boils, turn off the heat immediately, cover and let the eggs sit for 6 minutes. Transfer directly to an ice bath. Place a handful of noodles, the mushrooms and pork in a large ramen bowl. Cover completely with piping hot broth. Carefully add the just cooked soft boiled egg. Garnish with green onions and radish. This strong India Pale Ale has a beautiful haze with colors of copper and gold. It has a gentle aroma of sweet malts, melon and citrus fruits. There is a sweet flavor from the residual sugar that mellows the strong hop bitterness and gives a smooth mouthfeel. This pairing is good example of contrast pairing. The flavors are very different but side by side they excentuate the positives in each other. The rich, meaty and smokey broth is complimented by the sweet malts which also work to calm the pepperiness if the radish. The forward hops cut the fat from both the pork belly, egg yolk and broth just perfectly, leaving the mouth refreshed but the flavor of the ramen lingering. The piney quality of the hops also work with the zing from the green onions as they build each other's flavors nicely. Wise words, Shelley! Ramen (and IPA) cures all! I want that egg! I want that broth! Ramen … and the world makes sense again! My dad used to make ramen all the time when we were growing up. To this day, it's my all-time favorite comfort food! The beer pairing you have sounds fantastic! I'll definitely try that next time! I actually just made negima yakitori last night (Japanese grilled chicken skewers, perfect with beer) - do you have any recommendations for a good beer pairing? I'd love to try something different than my go-to Sapporo. It has some really nice coriander, orange notes and some more subtle ginger that should go really well with the yakitori. Let us know how it goes! Ooo…Wow! That Hitachino White sounds incredible! Coriander, orange, and ginger - Oh My! It sounds like heaven in a bottle! I will definitely look for that one! Thanks for the recommendation! wow, awesome idea using the smoked hock!! !